Residents of Nigeria’s Akwa Ibom State woke up to a shocking news as a dead owl was found in the seat of the speaker of Parliament. The people of the views that some individual or group must have been plotting to eliminate the speaker of the State’s House of Assembly, Rt. Hon. Barrister Onofiok Luke. Reports say the owl which is normally associated with witchcraft was found when staff of the assembly started making their way into the house. 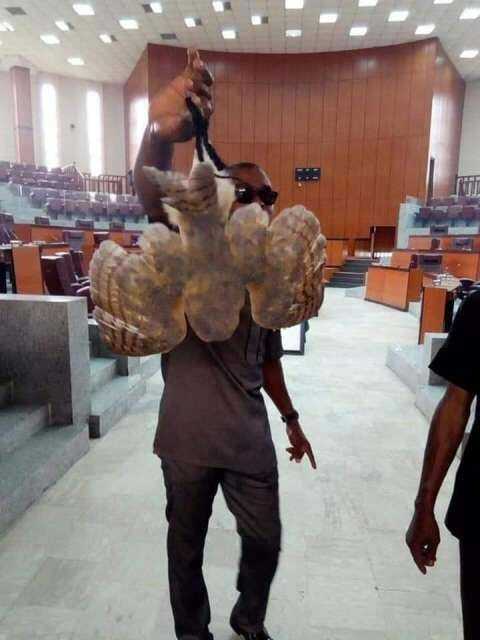 Photos of the weird bird being held by a man believed to be one of the staff of the House of Assembly has been tending on social media. The question most residents have been asking is how the owl made its way into the chamber and perched on no other seat than that of the speaker. Though there is no evidence of anyone having placed the owl in the speakers seat, some members of the public suspect either someone or a group of individuals might be up to some spiritual warfare against Barrister Onofiok Luke.